Masculine Part the Poet in me. THE WIDOW RANTER Directed by Karen Eterovich(Love Arm’d Prods) at HERE Arts Center, Dorothy B Theater (145 Sixth Ave, betw. Spring & Broome) on Monday, December 2, 2002, at 6 p.m. THE DUTCH LOVER Directed by James Hannaham &Target Margin Theater Co. at The Drama Book Shop (250 West 40th Street, betw. 7th & 8th Aves) on Sunday, January 5, 2003, at 2 p.m. If she had not, we would have had to invent her. If Shakespeare could look back to Marlowe, Marlowe to Chaucer, or Chaucer to the literary forefathers whose tradition he grew out of, Mrs. Behn imposed herself on history without precedent: she was the first woman to become a professional writer. Aphra had to invent herself. The life she led would have been extraordinary in any age, but for a woman of the 17th century not born to fortune or position it was nearly unheard of. 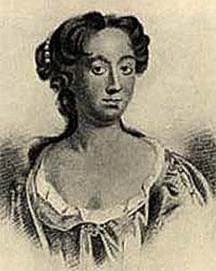 Aphra Behn was an adventuress who undertook the long and dangerous voyage to the West Indies, became involved in a slave rebellion there, and visited tribes of Indians who had never before seen Europeans. She was a spy for Charles II against the Dutch. She was a debtor imprisoned for expenses incurred in the service of the King. She was a feminist who vociferously defended the right of women to an education, and the right to marry whom they pleased, or not at all. She was a sexual pioneer who contended that men and women should love freely and as equals. She was a political activist who argued the Royalist point of view at Will’s Coffee House and from the stage of the Drury Lane theater. She was an early abolitionist whose novel Oroonokocontained the first popular portrayal of the horrors of slavery. Finally, she was a writer who not only insisted on being heard, but successfully forced the men who dominated the jealous literary world of Restoration England to recognize her as an equal. In a London that boasted only two theaters, she had seventeen plays produced in seventeen years. She wrote thirteen “novels” (thirty years before Daniel Defoe wrote Robinson Crusoe, generally termed the first novel) and published several collections of poems and translations. Along with her friend and colleague John Dryden, she is buried in Westminster Abbey – Dryden in Poets’ Corner; Aphra outside, at the entrance to the cloisters, where her stone has almost been worn smooth by three centuries of indifferent feet. Reconstructing Aphra: A Social Biography of Aphra Behn. The Secret Life of Aphra Behn. New Jersey: Rutgers University Press,1997. The Works of Aphra Behn. Janet Todd, ed. London: W. Pickering, 1992. Aphra Behn: The Rover and Other Plays. Janet Spencer, ed. New York: Oxford Univ Press, 1998. Akalaitis, Jo Anne. “From the First Rehearsal [The Rover].” Guthrie Program Magazine, Summer 1994, 24. Carlson, Susan. “Aphra Behn’s The Emperor of the Moon: Staging Seventeenth-Century Farce for Twentieth-Century Tastes.” Essays in Theatre/Etudes Théâtrales 14.2 (1996): 117-130. Carlson, Susan. “Cannibalizing and Carnivalizing: Reviving Aphra Behn’s The Rover.” Theatre Journal47.4 (December 1995): 517-539. Griffiths, Malcolm. “Past Polemics, Present Problematics: Complexities in Reclaiming Aphra Behn’s Plays for Contemporary Production.” The European Legacy 2.1 (1997): 22-27. Hughes, Derek. The Theatre of Aphra Behn. New York: St. Martin’s, 2001. Hutner, Heidi. Rereading Aphra Behn: History, Theory & Criticism. Virginia: Univ Press of Virginia, 1993. Kinney, Suz-Anne. “Confinement Sharpens the Invention: Aphra Behn’s The Rover and Susannah Centlivre’s The Busy Body,” in Look Who’s Laughing: Gender and Comedy. Gail Finney, ed. Langhorne, PA: Gordon and Breach, 1994, pp. 81-98. O’Donnell, Mary Ann, Bernard Dhuicq, and Guyonne Leduc, Eds. Aphra Behn (1640-1689): Identity, Alterity, Ambiguity. Paris: L’Harmattan, 2000. 183-189. Rubenstein, John. “Reflections on The Rover.” Drama and Performance. Ed. Gary Vena and Andrea Nouryeh. New York: HarperCollins, 1995. 395-399. Thompson, Peggy. “Closure and Subversion in Behn’s Comedies.” Broken Boundaries: Women & Feminism in Restoration Drama. Ed. Catherine Quinsey. Lexington: University of Kentucky Press, 1996. 71-88. Todd, Janet, ed. Aphra Behn Studies. Cambridge: Cambridge University Press, 1996. 66-83. Proudly powered by WordPress Theme: ChaosTheory by Automattic, updated by Vivian Selbo.